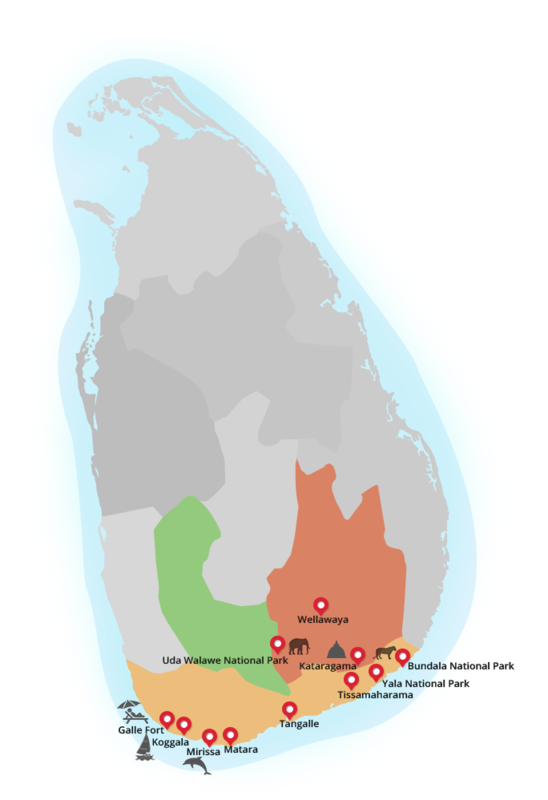 Yala National Park has a variety of ecosystems including moist monsoon forests, dry monsoon forests, semi deciduous forests, thorn forests, grasslands, fresh water and marine wetlands, and sandy beaches. The area under forest cover mainly consists of Block I and rangelands of open parkland (Pelessa grasslands) including some extensive grasslands. The forest area is restricted to around the Menik River while rangelands are found towards the sea side. Other habitat types of the Block I are tanks and water holes, lagoons and mangroves and chena lands. One of the main features of the park is the number of large rocks and boulders found scattered around the area. Large monolithic structures such as Patanangala, Jamburagala, Akasha Chaitya are iconic symbols which make up the landscape of the park. Yala provides some of the best wildlife viewing in all of Sri Lanka with most of the large mammals seen regularly including elephant, water buffalo, sloth bear, mugger crocodile and the most iconic animal of the park, the leopard. Made popular by several documentaries, the leopard density of Yala was made public knowledge bringing in hundreds of tourists every year. The general acclimatized nature of these felines makes Yala one of the best places in the world to see a leopard. Often seen either lazing atop a tree or even across one of the game trails, these apex predators primary prey is the Spotted Deer who are found quite numerously across the park. Being the ultimate survivors and opportunists they also feed on other species including the Sambar which is the largest deer species in Sri Lanka and wild boar. But Yala is much more than just leopards, as the wildlife diversity found in the park is amazing. During the dry season which spans from June – September, large concentrations of Mugger Crocodile can be seen in the dwindling waterholes. The varied habitats from rocky outcrops, riverine forests, scrub jungle and numerous waterholes make Yala an excellent destination for birders especially for dry-zone species with over 200 recorded species. Among the branches and scrub jungle vegetation, keep your eyes out for Blue-faced Malkoha, Green Bee-eater, Orange-breasted Green Pigeon and flocks of noisy Malabar-pied Hornbill. At the waterholes and shallow lagoons, Painted Stork, Lesser Adjutant Stork, Asian Openbill, Indian Darter, Common Kingfisher are among a variety of water birds routinely seen. Yala is also one of the few locations where the critically endangered Black-necked Stork may be seen. The strikingly beautiful Indian Peacock and the country’s national bird, the Sri Lanka Jungle Fowl are abundant here with the male peacocks routinely dancing and coming in to breeding plumage during the months of October to March in the wet season. Migrant species can be encountered typically from November – February including Blue-tailed and European Bee-eaters, Hoopoe, Pied Cuckoo and Indian Pita. Changeable Hawk Eagle, White-bellied Sea Eagle, Crested Serpent Eagle, Brahminy Kite and Brown Fish Owl are among the most regularly seen birds of prey.